The cave tour is of two (2) hours duration, length 1271m 1298 steps minimum age 6. Still pools of the underground River Styx display stunning reflections of great beauty. Three of Jenolan's largest crystal formations, plus the awesome Minaret are in this cave. 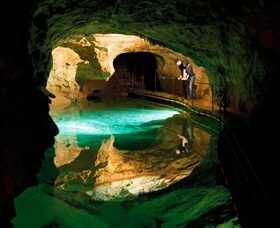 Coach tour departs daily from Katoomba at 10.35am and departs the Caves at 3.30pm returns by 5pm to Katoomba. It also includes coach travel and informative commentary. Please meet for this tour at the Bus Stop at the Carrington Hotel, 15-47 Katoomba Street, Katoomba NSW 2780. Please arrive 15 minutes prior to departure time. Please wear enclosed shoes for the cave tour. This service may operate as a co-share and departure is subject to minimum numbers travelling.